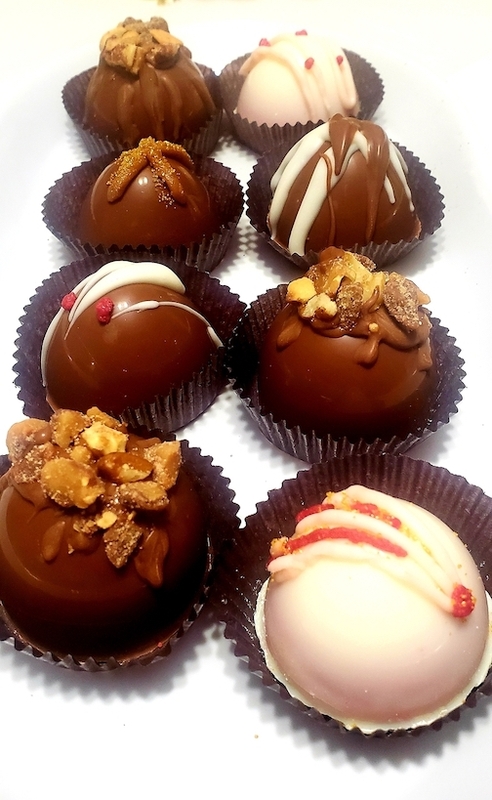 The sisters make chocolate-covered pretzels, apples, strawberries…chocolate fried Oreos…six kinds of truffles; custom orders can be submitted. They sell primarily through their website. Mikaela basically laughed in my face about their company having a physical storefront. “I wouldn’t mind a factory but not a storefront,” she said. Maybe one day. “Everyone that’s tasted [their chocolates] on a professional level tells us that we have a million-dollar company,” Hopkins said. Chocolates are hand-delivered for local orders. Since they push the online, the Browns have sold their chocolates around the country, everything but the strawberries because those don’t ship well. California. Texas. Washington. The chocolates get packed “extremely carefully,” Mikaela said, but what’s really impressive is that a cross the country order for some truffles even exists at all. Those are some really good truffles. Right before the news and their tempered explosions to the sky (we were in Biggby Coffee so they couldn’t cheer too loud), the talk had turned to a what-if scenario. What if, one day, the chocolate business, in priority terms, took over their ministry? Like a day that hints at some real capital being invested for the first time? The sisters were more known throughout the city and around the country for their dance ministry; even today, their ministry leads almost all conversations and the chocolates, the afterthought, only comes up in oh-by-the-way talk. Endless Smiles is the family’s dance ministry that travels the country and Unite Our Grounds was Myeka’s vision to help unite community through showing love and promoting unity. The ministry is where the chocolates began; the three would volunteer at retirement facilities and the Browns would make chocolates, a menu of “everything,” they said, for the residents. The two used to cook and bake all of the time when they were younger; Nigerian food was mentioned but the chocolates were…chocolates. And the residents at the retirement facilities kept goading the sisters to make it a career. It was Angel who uttered the final ask. Outside of the website stuff, she wasn’t going to do any of the work. The business would be all theirs. She would provide the support. Hold their cellphones. But mom is embedded in their company story; she’s in the name. The company started as Myeka, Angel, and Kaela’s Chocolates, but later changed to Myeka and Kaela’s Chocolates. In the future, the sisters will try more interesting flavors and combinations. Their Marg Butter Creams are their signature chocolate.